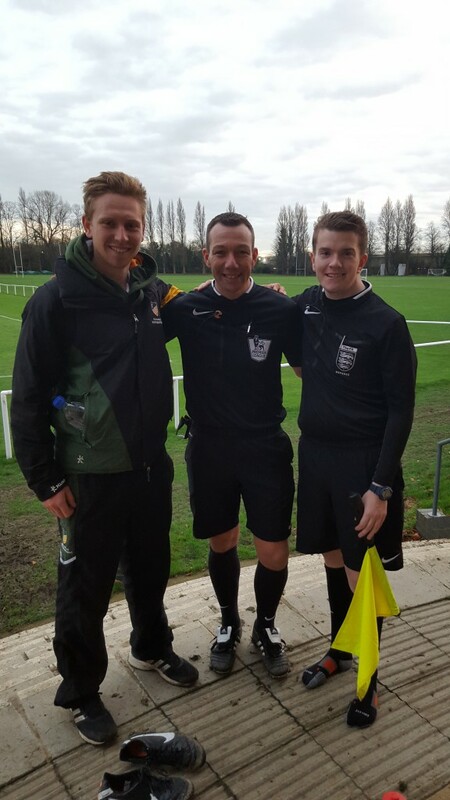 The University of Nottingham men’s football team got a taste of Premier League standards on Wednesday when top-flight referee Kevin Friend agreed to officiate their BUCS league match at Highfields Sports Ground. Although perhaps more familiar with the likes of Raheem Sterling, the Premier League referee was asked to oversee the game against The University of Stirling, who had made the journey south to contest the top division clash. In a game that passed off without much controversy, it was actually the referee who contributed some of the more memorable moments. Much to the delight of the home crowd, the first free kick of the game warranted the use of the ‘vanishing spray’ but it was the marginal delay to kick off that was the main talking point on the sidelines at half-time – a result of the match ball having been left locked in the officials’ changing room! Nevertheless, the 600-mile round trip turned out to have been one well spent for the visitors as they ran out comfortable winners – the final score UoN 1-5 University of Stirling. Fresh from his duties as fourth official at Manchester City’s recent home defeat to Liverpool, Mr Friend had taken the time out to officiate the University’s Premier North Division fixture ahead of taking charge of Bournemouth v Everton at the Vitality Stadium on Saturday. He was approached to referee the game against Stirling by fourth year American & Canadian Studies student, Tom Tolond. A keen referee himself, Tom coordinates all refereeing appointments for the University’s men’s and women’s football teams. “We wanted to see if we could do something to match that. I asked Kevin if he’d be available to referee the game and he’s been really great about it”. Tom also officiated as one Kevin’s assistants for the game which meant hooking up to the referees’ headset, allowing him to remain in contact with Kevin throughout the game. As a Level 5 referee , Tom met Kevin via the National Regional Development Programme, the FA’s initiative to recruit, retain and develop referees involved in 11-a-side football. Tom says that he’s open minded about the idea of taking his own refereeing career further, although with so few referees able to become fully professional he believes it’s important to concentrate on other career options too. However, Kevin was keen to stress the high standard of refereeing in England at the moment and the bright future ahead: “We’ve got some really good referees coming through that have got some real raw talent. They are only going to push boundaries and push themselves higher to get into the professional game” he said. “It’s important to give these referees something to aim for, when you’ve got the likes of Tom coming through who’s dedicated and works hard at what he does. Hopefully in the next few years he can start moving up the ladder as well”. The UoN men’s first team’s next fixture is at home to Northumbria University, Wednesday 2 December at Highfields Sports Ground.